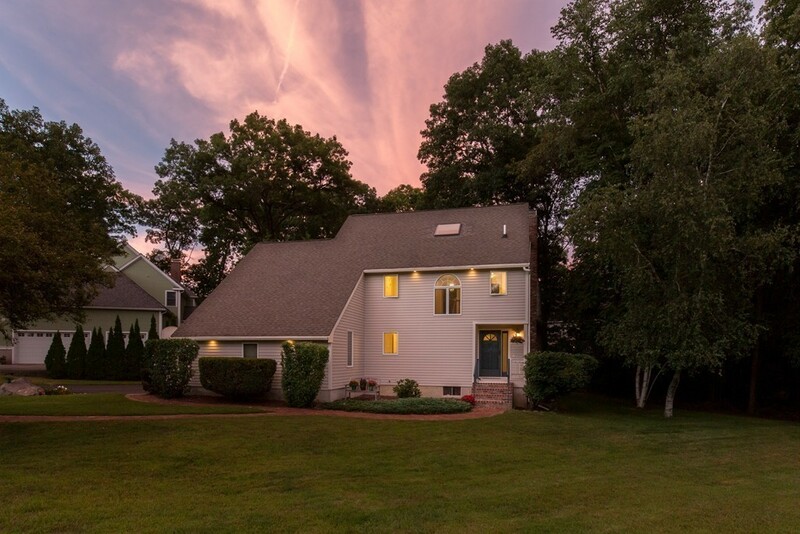 Spacious 3 bed contemporary saltbox colonial on stunning corner lot in desirable well established Newburyport neighborhood. Flexible 4 level open floor plan - great for "multi-generational" living & entertaining! Flooded w/ sunlight, soaring vaulted ceilings, skylights, gleaming wood floors. Lovingly maintained, updated, freshly painted inside & out. Renovated cherry kitchen boasts stainless steel appliances, Cambria quartz counters/soft close drawers, tile floor; opens to vaulted formal dining rm w/ skylight & vaulted family rm w/ skylights, wood floor & french doors open to large back yard deck. Front to back generous living rm to enjoy a crackling fire in the brick fireplace, partial vaulted ceiling & french doors to smaller deck. 1st floor laundry. Private master bed suite boasts double closets, laundry chute & 3/4 master bath. 2nd bed mini suite w/ access to full bath, 3rd floor bed/sitting rm. LL Bonus rm w/ wine/wet bar, sauna, steam shower!